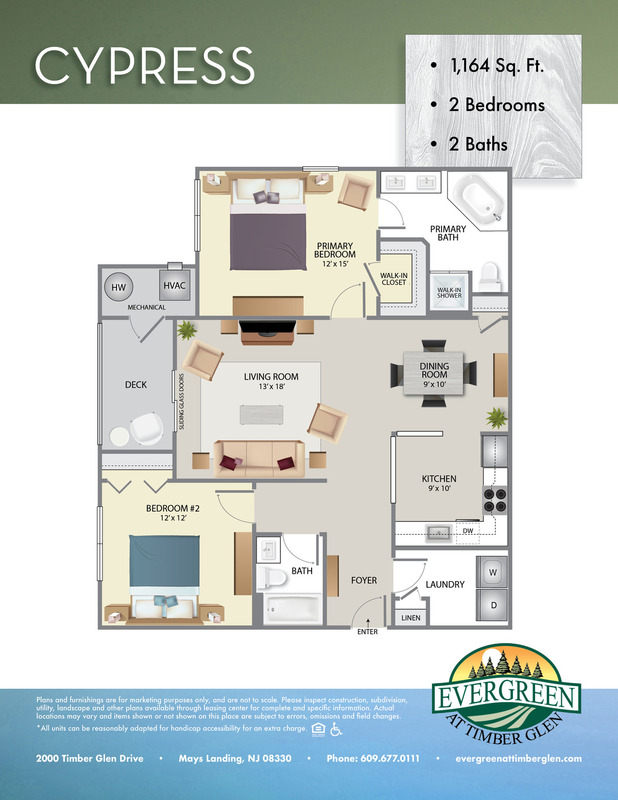 Evergreen at Timber Glen offers a variety of 1BR/1Bath and 2BR/2Bath apartments and 3BR/2.5Bath duplex townhomes, including ADA compliant layouts throughout the community. With square footage ranging from 1,164 square feet to 1,660 square feet, the living space is plentiful and ideal for a variety of lifestyles. Every residence at our property features a ceramic tile kitchen and bath to provide an elegant look and feel from the moment you step inside. You’ll also enjoy an intrusion alarm for an extra layer of protection, central air and heat with your own thermostat for year-round comfort, and a full-size washer and dryer inside your residence. Select homes have been recently renovated and updated with brand new granite countertops, stainless steel appliances including a dishwasher and subway tile backsplashes as well as luxurious LVT and ceramic tile flooring throughout. 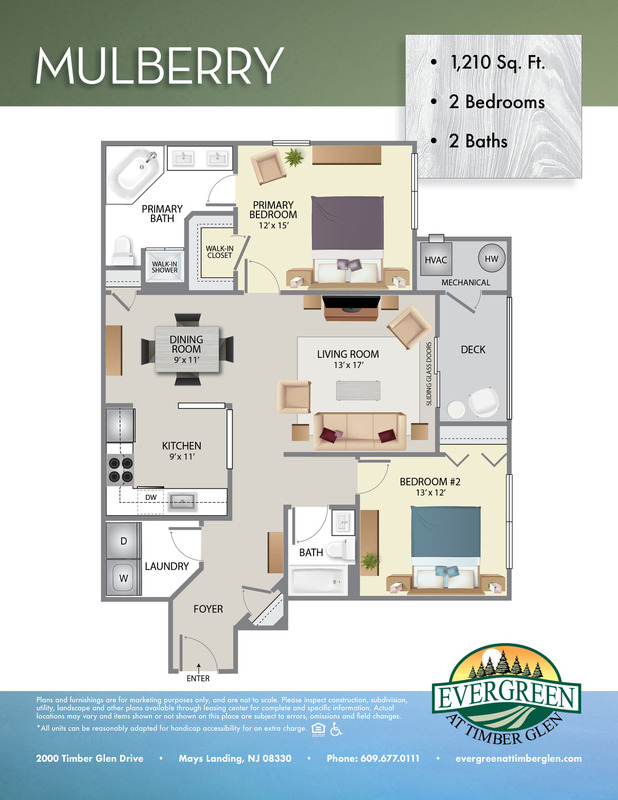 Each of the 498 apartments and townhomes on the grounds of Evergreen at Timber Glen has been meticulously maintained and we look forward to welcoming you home. Once you arrive, we’re confident you will fall in love with not only the interior and exterior finishes of the residences, but the beautiful grounds and amenities as well. The swimming pool, tennis courts, fitness center green spaces and central pond combine to create a resort-like feeling. At Edgewood Properties, we value the opportunity to create apartment homes for people of all walks of life. Not only do we design every apartment home for maximum value, comfort and convenience, we treat every resident as we wish to be treated. 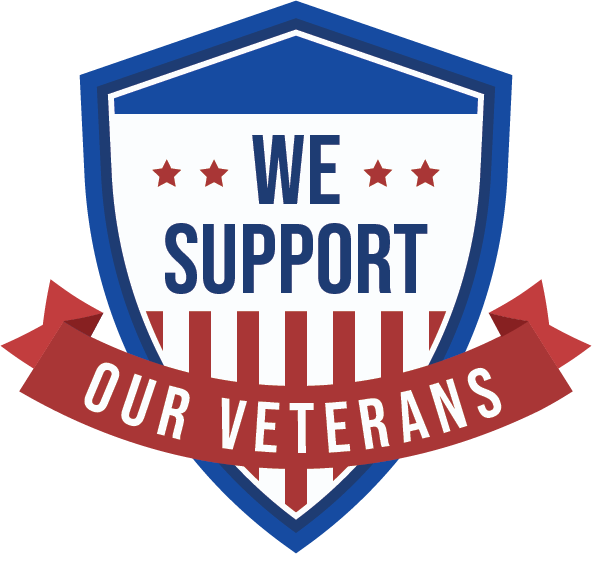 We pride ourselves on providing not only a place to live, but a level of service that is above and beyond expectations. Since 1992, we have been perfecting our building and design process and practices to create high quality residences. Every aspect of every residential unit has been optimized for luxurious, comfortable, convenient living. 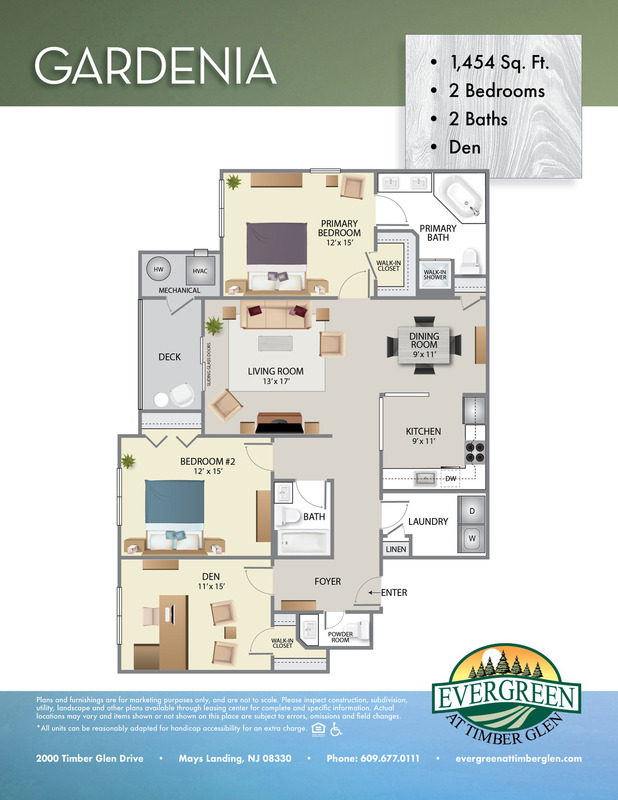 We invite you to browse the floor plans above, download pdfs and consider how Evergreen at Timber Glen will suit your lifestyle. To continue painting a picture of what it’s like to live at our community, visit the photo gallery and take in our virtual tour. When you’re ready to take the next step, or if you have any questions at all, please contact our leasing office at 609-677-0111 or contact us online. Our friendly leasing staff is at-the-ready to answer any questions you may have, schedule a tour at a time that is convenient for you and get your application started. Floor plans are renderings of artists. Every dimension is approximate. Actual specifications and product may vary in detail or dimension.